Every couple's idea of a dream wedding location is different. Some prefer a grand cathedral while others dream of a rustic barn. 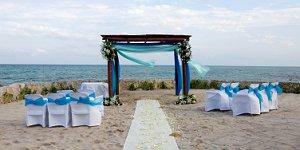 For others, a windswept beach is the ideal location for their dream wedding. Explore different venues before making a final decision. The glittering celebrations of real life royalty, including celebrity weddings and events detailed in bridal magazines, can inspire thoughts of your dream wedding. Websites, magazines, television shows, and movies give you a glimpse of perfect celebrations and today's hot trends, but you can't find your dream wedding in the pages of a magazine or on the set of a summer blockbuster. To understand your desires for a fantasy wedding, you need to discover the type of celebration that would make you feel happiest as you exchange vows with that someone special. Where should your dream wedding be? No website, wedding planner, family member, or friend can answer that question. The answer can only come from considering what you feel is the most romantic, happiest, most elegant place you can envision to exchange vows. To find that place, you can ask yourself some critical questions. The solemn, echoing chambers of an ornate cathedral may appeal to some couples, while others dream of exchanging vows under a bright, clear sky. Indoor locations include not only houses of worship but also ballrooms, reception halls, and other facilities with stunning architecture and beautiful décor, while outdoor locations range from isolated beaches to towering cliffs, waterfalls, exotic gardens, and more. For some couples, the happiest place to be married is a parents' garden or in the church where they were baptized, while other couples may want to start their life together with new and unique experiences hundreds or thousands of miles away from everyday locations. A home wedding can be anywhere within a relatively local radius, whereas a destination wedding may be in fun or captivating locations such as Las Vegas, Europe, or on a wedding cruise ship. When you envision your wedding, do you picture a classic petal-strewn aisle embraced by neat rows of chairs, or do you see a more unusual backdrop for your sacred vows? Whether you are interested in getting married at home or in a unique destination, you could consider not only traditional venues such as hotels, churches, halls, and gardens, but also more outrageous locations such as an aquarium, museum, vineyard, castles, deserted island, or even on a roller coaster. Asking yourself these questions will help you narrow down your dream wedding location, but to make that dream come true you need to be a bit more practical. 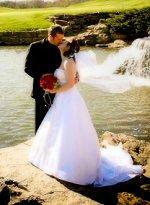 Time: An elaborate, exotic wedding or one that takes place far away may take much longer to plan than anticipated. When you know where your dream location is, you can contact appropriate vendors and inquire about how long it will take to plan a wedding at that location. Popularity: The more popular a wedding location is, the more planning time will be required to ensure you can create your ideal celebration. Furthermore, you should also consider that if a location is very popular, you may be sharing your same wedding date or weekend with other couples, which could make the event less special and more chaotic to coordinate. Cost: The tower of a Scottish castle overlooking a pristine loch may be a wonderful wedding location, but it can also be far outside the budget of many couples. If a dream wedding location is more than your budget can handle, you may want to consider eloping instead of having a full wedding, or you may want to plan for a more affordable yet similar location. Practicality: Some dream locations simply aren't available for public celebrations or they may be inaccessible for the couple to use. An isolated beach may be perfect for a private ceremony, for example, but if it requires a three mile hike through rough jungle then many wedding guests may be left out of the celebration. The key to making your dream location a reality is to carefully balance your fantasy festivities with the practical concerns of planning a wedding. Keep an open mind as you consider alternatives for your nuptials, and you may find that your dream location is closer than you think. Some couples may not be able to make their dream location a reality. In this case, consider embracing a theme to bring that location to your wedding, instead of taking your wedding to a dream location. Want to get married in Disney World but can't afford the trip to Florida? Consider a Minnie and Mickey themed wedding in your home town. Want a beach wedding but can't have one big enough for your guest list? Opt for a luau themed reception instead. By choosing a dream theme, you can enjoy your dream location no matter where your wedding takes place. There is no dream wedding location that is suitable for every couple, but by examining what is important and balancing that fantasy with the practical considerations of wedding planning, every couple can have their dreams come true on their wedding day. In the end, no matter where the wedding is, if it takes place between two people whose love is a fantasy, then it will be a dream location - right in each other's arms.